Miss E's birthday was this week, and she says she had a "GREAT!!!!" day! It started knowing that she was getting out of many of her chores, and she got to open presents before Daddy had to go to work. She received punch balloons from Mr M (Mr R picked up an oreo carmel apple for her at the farmers market last week, which was quickly devoured, she was sweet to share! ), a large tub of "girly" legos from us, and and an apron I made for her (right now she really likes sun flowers). 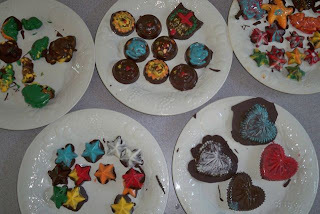 made chocolates using molds (some were borrowed from G'ma, and we picked up a couple more). The kids all had fun "painting" them, then choosing a filling (caramel, orange, or just more chocolate) and banging the air bubbles out on the table was quite popular too! They did not turn out perfectly, but the kids sure had a great time, and they were yummy! A bonus was that Daddy was able to come home early enough to have lunch and enjoy some chocolates with us! I had a small project that I needed painted and she had asked if she could do that portion of the project, so she got to do that. 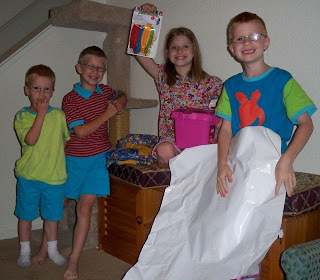 By the time she had finished that her gift from Nana had been delivered by the UPS guy, it was a large clear storage bin filled with clay, tools, and an idea book! That took her up until it was time to go pick up the sub sandwiches she had requested for dinner! The rest of the day was spent doing more of the clay and having some nice family time. 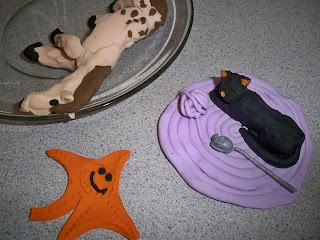 Here is a picture of the first things she made with her clay, the horse had a hard time in the oven, but she did do a great job on it!